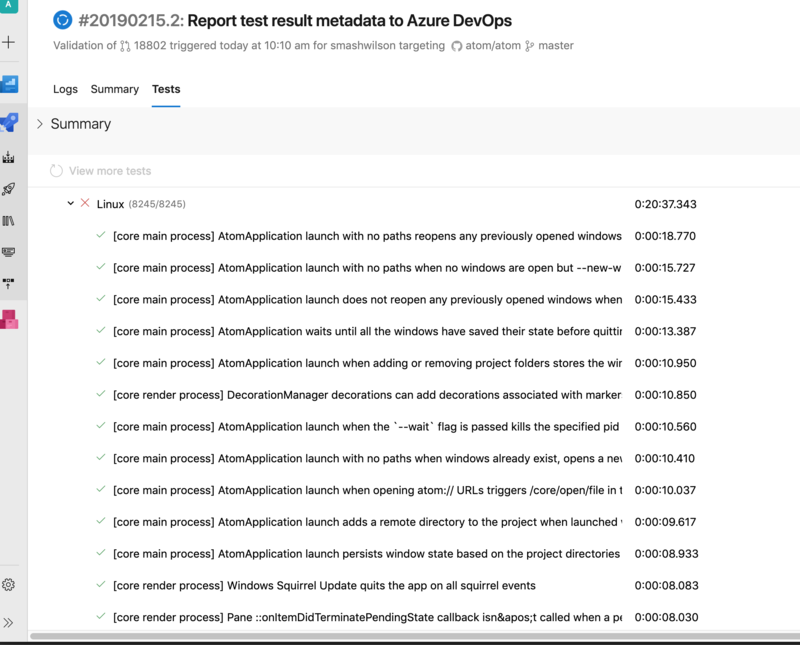 Use the Jasmine JUnit reporter to output test result metadata, then publish it to Azure DevOps with a PublishTestResults task. This may or may not require us to fork jasmine-reporters. If you get farther along I'm definitely happy to close mine out! Does that expect a forward slash? @daviwil how does this look? I've overridden the default Jasmine JUnit reporter to ensure the full test description is present in the testcase name, and I'm post-processing JUnit XML files from everywhere to prepend the [which suite it's from]. We have one test "run" for each platform. Er, maybe no separator at all? Merging despite test flakes because... this is to help us track down test flakes.